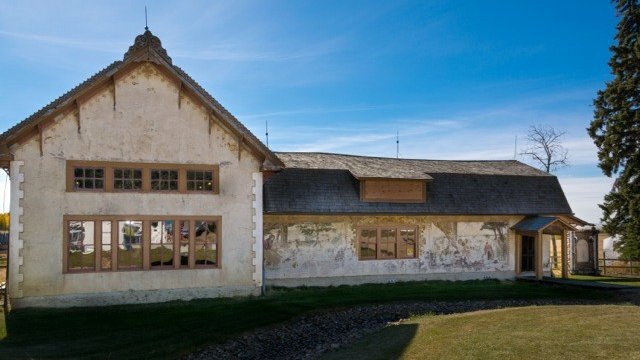 St. Walburg, Saskatchewan was a cultural hotspot this year during Culture Days. With a variety of activities planned throughout the Sept. 27 - 29 weekend, from interactive ceramic workshops, cake decorating, museum tours, visits to the Chuck Wagon Interpretive Centre, as well as tours and other onsite activities at the historic Imhoff Gallery, visitors had plenty of culture to see and experience. The St. Walburg Allied Arts Council (SWAAC) was a first-time Culture Days activity organizer in 2013. Culture Days is devoted to providing Canadians with opportunities to participate in, and appreciate, all forms of arts and culture. Through an annual three-day national celebration each September, hundreds of thousands of artists and cultural organizations in hundreds of cities and towns come together and invite Canadians to participate in free interactive and “behind the scenes” activities to discover their cultural spirit and passion. Phyllis Imhoff, SWAAC member and volunteer administrator of the Imhoff Gallery in St. Walburg recently spoke to SaskCulture about the community's Culture Days experience. SC: What would a visitor have experienced when they visited St. Walburg during Culture Days? PI: “The Imhoff Gallery was open by special arrangement for the Culture Days weekend. The Gallery is usually closed by this time of year because it is not heated. However, for Culture Days, we purchased heaters to temporarily heat the building to facilitate a more comfortable environment for Culture Days visitors. Free tours of the Gallery were given by very energetic student tour guides. They were able to tell visitors about some of the history of Imhoff’s life and his work. “We set up a tent to host some performing artists. We had a local band play and also brought in a German brass band from Humboldt. This was in celebration of German culture, which was the first language and native country of Mr. Imhoff. The music definitely got people dancing! We also offered free food in the form of a barbecue and refreshments. SC: Do you consider your Culture Days experience a success? SC: What about Culture Days was valuable or positive for the Imhoff Gallery and the SWAAC? PI: “For the Gallery, it was wonderful that so many people came to visit and learned about Mr. Imhoff and his contribution to the arts in Saskatchewan. Culture Days created interest in the art gallery. Many people, some of whom were locals who have lived close by for years, had never taken the time to stop and find out what the Gallery is all about. “None of the students we hired to give tours in the gallery throughout the weekend had ever been there before. It was interesting to see their initial reaction, which was not much different from any other visitors that just happen to discover our Gallery is full of paintings. It is always a reaction of great amazement and excitement. They were so excited to be able to take visitors on tour. This is very positive for us at the Gallery. Every year, the Imhoff Heritage society hires a summer student and it is reassuring to know that there are interested young people out there who are keen to work in this area. SC: Do you have any advice for first time Culture Days activity organizers? PI: “We didn’t get working on our Culture Days plans until May. Although we seemed to do very well in a short period of time, I think it may be better to start thinking about next year's Culture Days a little earlier. SC: Do you plan on participating in Culture Days next year?